In this article, you will see how to use AngularJS 2 in PHP via the PrimeNG UI components. First we need to create an AngularJS 2 application from the beginning and then we will create a project. Finally, we will run the project. Before writing an AngularJS 2 application, we need to first to set our development environment by installing the needed frameworks. 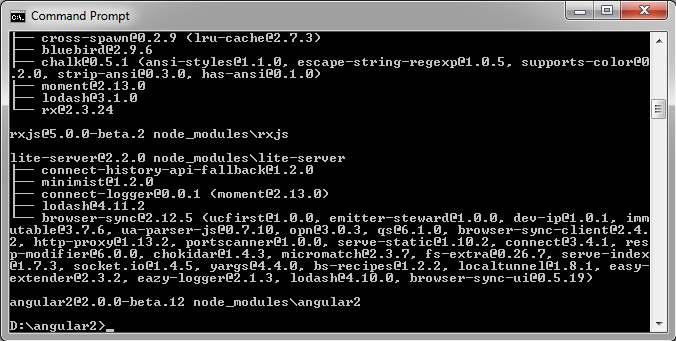 First, we need to install Node.js (node and npm). You should install the Node.js distribution compatible with your operating system. The next step is to create the project folder. 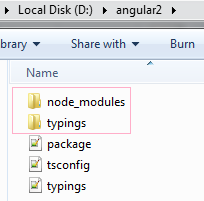 Choose a location on your computer and create a new folder named, angular2; this folder will contain all the files of our application. The content of this file and its values may differ; but, in order to modify its content/values, you have to first understand the meaning of each entry. A good start for learning TypeScript can be found in the official tutorial. Note: In the event that you see some errors (in red) do not worry. The install typically recovers from these errors and finishes successfully. 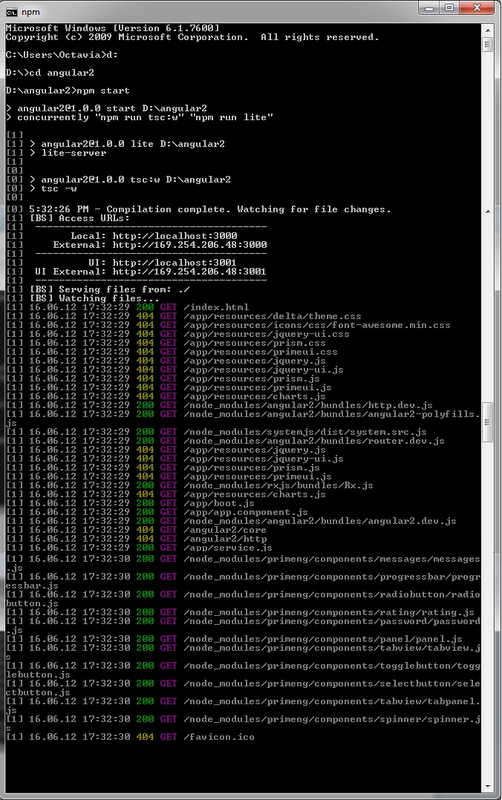 As you can see in the figure above, the result of running npm install command is the two new created folders: node_modules and typings. The application folder is named app and we manually create it and locate it in our project folder, angular2. So, at this point we have finished all the prerequisites and we can start developing the application. In order to start developing the application, we need first to create the component file. Practically, we build an Angular2 JS application by creating and shaping components. These components behave as the “bricks” of our application. It is compulsory to define at least one component, and for this we should write a *.ts file. Our example will be an “Hello World!” example, so we can name our file as app.helloworld.ts, and place it in the /angular2/app sub-folder. 1: Angular2 JS is built in a modular way, that means that we can build our components by importing the right artifacts from the right modules in our component. Typically, you will import at least the Component artifact (decorator function) from angular2/core module. This is needed for defining a component. 3: The Component is a decorator function that takes a metadata object; by using metadata we model the look and comportment of our component. A function can be applied to a component using the @ prefix. 4: The selector field is part of metadata object; practically, this field points to a CSS selector for an HTML element that represents the component. In our case, the element for this component is named hello-world. This element will be used in our HTML application, and AngularJS will instantiate our component for each occurrence of hello-world. 5: The template field is also part of metadata object. Via this field, we indicate the HTML markup that should be rendered for the hello-world occurrence. We will simply render the text Hello world!. The template can be very complex; it may contain data bindings, use other components, etc. 8-9: The AppComponent is the component class. Here is the business logic of our component. For example, here we can fire HTTP requests, invoke services, have routings, etc. In our case, the component class is empty, since we simply display plain text. But, as you can see, even if it is a do-nothing class, we cannot skip its signature! The export meaning is pretty clear. We need to export our component so that we can import it elsewhere in our application. The root component acts as a “starting” point for our component tree. In an Angular 2 application, we need to tell Angular when to start up. This is done using the bootstrap method, passing in our AppComponent along with other module dependencies. Once the application is bootstrapped, Angular looks for our root component in our markup. 1: We import the bootstrap decorator function specific for applications that run in a Web browser. Most probably, your first Angular2 JS applications will use the Angular’s browser bootstrap function, since the Web browser is the easiest way to test your work. But, you have to know that Angular2 can load a component in a different environment (e.g. on mobile devices). In such cases, the bootstrap function must be loaded from specific libraries, not from angular2/platform/browser. 2: We import our AppComponent function. 3: We bootstrap/load our root component. IE requires polyfills to run an application that relies on ES2015 promises and dynamic module loading. • The packages node instructs SystemJS about the actions that should be accomplished in case of a request for a module from the app/ folder. • The System.import call tells SystemJS to import the main file (main.js – after transpiling main.ts). Displaying the application to client involve the “replacement” of hello-world tag with the proper template. Remember that this tag is actually a selector in our component. When the bootstrap() function is called, Angular2 processes our component and locates the metadata object that contains the hello-world selector. Furthermore, it locates the hello-world tag and loads our application between those tags. The element tag and the selector must have the same name. In Angular 2 we use the Injectable decorator to let Angular know a class should be registered with dependency injection. The Angular 2’s HTTP library lets you call all your basic HTTP methods. import ‘rxjs/Rx’ pulls in the RxJs library so we get access to methods on Observables. Without adding this line we wouldn’t be able to run .map() on the return from http.get() method since the returned Observable wouldn’t have the map method available. This article has explained how to make a simple HelloWorld example using AngularJS 2 with PrimeNG UI components and PHP.